I previously shared about our first stop on the “en primeur” media tasting of barrel tastings in the Texas Hill Country at Wedding Oak Winery. This week, we continue with Texas Tuesday in Tow, Texas. For our next stop on the Roll Out the Barrel Tour, we went back to the root of the Hill Country wine industry. Ed and Susan Auler started in the wine business decades ago, convinced that the state of Texas had terroir similar to other famous regions they had visited. Alongside many experts in viticulture and oenology, they continue to be surprised by the diversity and potential of the region. Winemaker Sergio Cuadra walked us through their current projects with geological maps of the region, a throwback to a wine we tasted in barrel last year, and the newly pressed juice from a newly planted vineyard which punctuated the statement, and surprised us all, with just how much potential remains to be discovered. We began with the 2018 Sauvignon Blanc “Vintner’s Selection” from Mesa Vineyard in the tasting room before heading to the beautifully set table in the barrel room. The Aulers are the consummate hosts. 2017 Chardonnay Certenberg Vineyard “Terroir Reflection” – Texas Hill Country. Mostly second-use barrels, aged 14 months, 100% malolactic fermentation. Notes of apple, citrus, and a softened finish. 2016 ExTerra Mourvèdre Salt Lick Vineyards – Texas Hill Country. Held in barrel for 18 months using 20% new American and French oak. Brick red, deep fruit, spice, tobacco, leather. Weighty and rich. 2016 ExTerra Tempranillo Salt Lick Vineyards – Texas Hill Country. Deep plum, black cherry, coffee. American oak gives spice and softened tannins. I’ve heard so much about these wines. A treat to be able to sample the pinnacle of Fall Creek winemaking. 2017 Tempranillo Salt Lick Vineyards “Terroir Reflection” – Texas Hill Country. Bing Cherry, savory and spicy. This chewy wine has just been bottled, soon to be released. 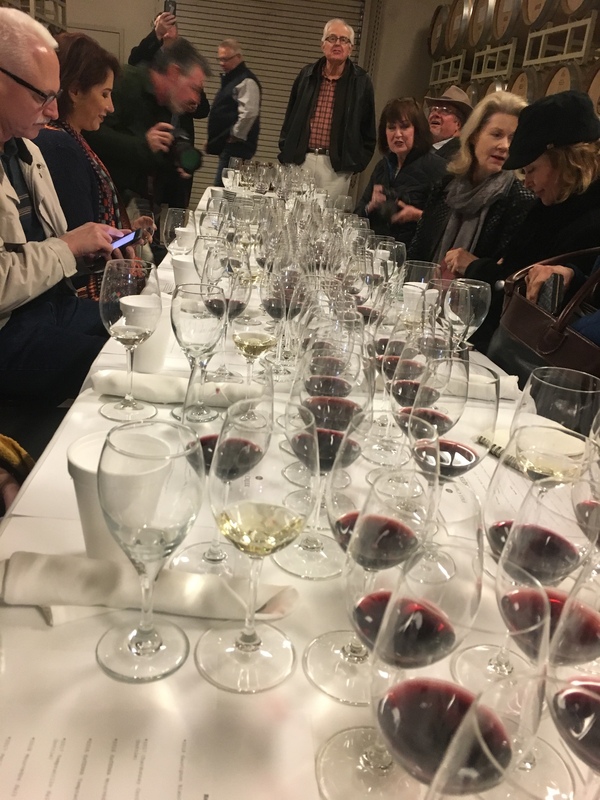 2018 Mourvèdre Salt Lick Vineyards – Texas Hill Country. Barely in barrel, the bright cherry and acid is already rounded out and softened. Love this already. 2017 Petit Verdot Certenberg Vineyard – Texas Hill Country. We tasted this wine last year and it was fun to see what it has become. Deep dark fruit, licorice, black olive. 2018 Cabernet Sauvignon Driftwood – Texas Hill Country. Surprise! These 3-year old vines are already producing complex and concentrated juice on limestone, just below their Driftwood tasting room. Composed of two-thirds from that vineyard, one from Salt Lick. Chef Bryan Gillenwater, owner of Bryans on 290 in Johnson City, created appetizers to be enjoyed with the tastings. I have been wanting to visit the quaint restaurant for years. I’ve watched his success bloom, and with it, the faithful following and confidence to push boundaries. Each was absolutely delicious. Want to sample Fall Creek wines and Bryan’s food at a creative and fun event? Together with Salt Lick BBQ, Fall Creek and Bryans290 are hosting a Three-Course Progressive Dinner THIS THURSDAY, March 28th at 6:30. For more information and to purchase tickets, visit their events section. For more on Fall Creek Vineyard’s history and their vast line of wines, visit previous posts and their website.